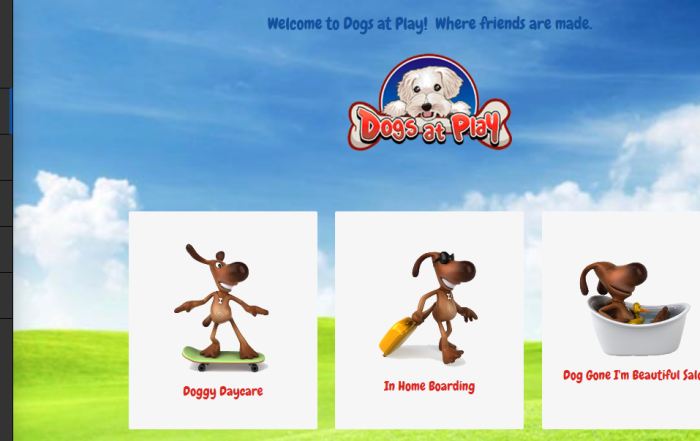 Welcome to Dogs at Play! Where friends are made. With over 1500 square feet of cage free indoor play area, and one of the few doggy daycare facilities to offer a 950 square foot fenced outdoor play and potty break area, we guarantee your dog will have a great time! Bring your dog to play for the day so they can come home ready to relax with you for the evening. Daily, weekly and monthly rates available. When you need to be away for longer than just a day, let your pup have all the comforts of home. We provide cage free, in home dog boarding. During the day your dog will play at the Dogs At Play daycare centre, then spend their nights relaxing in a staff member’s home. Spaces are limited so please book early. Regular bathing and grooming is an important part of keeping our pups happy and healthy. Why not bring your dog home from doggy daycare looking and smelling great? Book your dog in for a bath, brushing and ear cleaning in our Dog Gone I’m Beautiful Salon. Discounts are available for salon and daycare combinations. They were pooped for a couple of days…Oakley didn’t show signs of his old self (rambunctious and mischievous) until Wednesday…It’s always hard to go away and leave them, but this was a great experience. Thank you again Judy for your wonderful care…and thank you to your staff as well. I love the ‘no crate’ facility and how great the staff are. They treat my dogs like their own…Hershey and Rolo look forward to arriving and they are tired when I get them home which is really great. …5 out of 5 stars. Truly a great experience for my dogs and myself, a great facility, big and open. Plenty of toys, beds and kept clean, with wonderful, caring and attentive staff. Both Buddy and Rusty came home obviously happy, healthy – and much to our surprise not overly excitable. This tells us they had a great time with you and we thank you very much for taking great care of them. We will definitely use your services again and we recommend your services without hesitation. Book now to reserve a spot for your pup! Check out all the fun our guests have!